Nissha FIS is established and operates based on the following objectives: principle, fundamental rule and practical ethics. To create a safe and comfortable environment, to protect human lives and natural resources on the Earth. To create more advanced products with the development of innovative technologies, creativity and persistent efforts. To consistently put in our best efforts to produce products of the best quality. To establish a working environment in which the company's staff have the chance to display their full abilities, with strong respect for everyone's talent, personality and independency. Nissha FIS will do its best to respond to the market's requirements with strong conviction and sense of dedication. We develop, design, produce, and sell gas sensors (mainly semiconductor type) and its applied products. Nissha FIS has been certified for ISO 14001:2004 and JIS Q 14001:2004. Nissha FIS has been certified for ISO 9001:2015 and JIS Q 9001:2015..
We pursue to harmonize environmental air and water sensing technology with its application technology, enhance planning ability and system technology, then contribute to society by providing products creating a safe and comfortable environment. We supply products exactly meeting our customer's needs, increase “customer satisfaction”, then proceed with continuous improvement for effectiveness of Quality Management System (QMS). 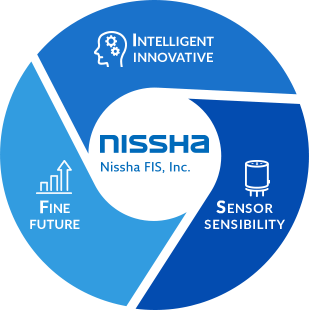 We strongly emphasize education and training to enhance ability, personality, and independence of all the Nissha FIS staff, which will lead to a stable supply of high quality products. We observe the laws and required rules related to Quality Management System (QMS), establish a quality target being technically and financially possible in order to achieve a fundamental quality plan, through continuously reviewing and maintaining the validity of the plan.